It’s ColourPop time! This brand exploded on social media over a year ago and it has been big ever since. And for good reason — they offer pigmented products at affordable prices. When they had a flash sale a month ago, I snatched up a variety of their lip products to review for you all. I have everything they offer for lip products except their lip pencils. Ready to see if they’re worth $5-$6? 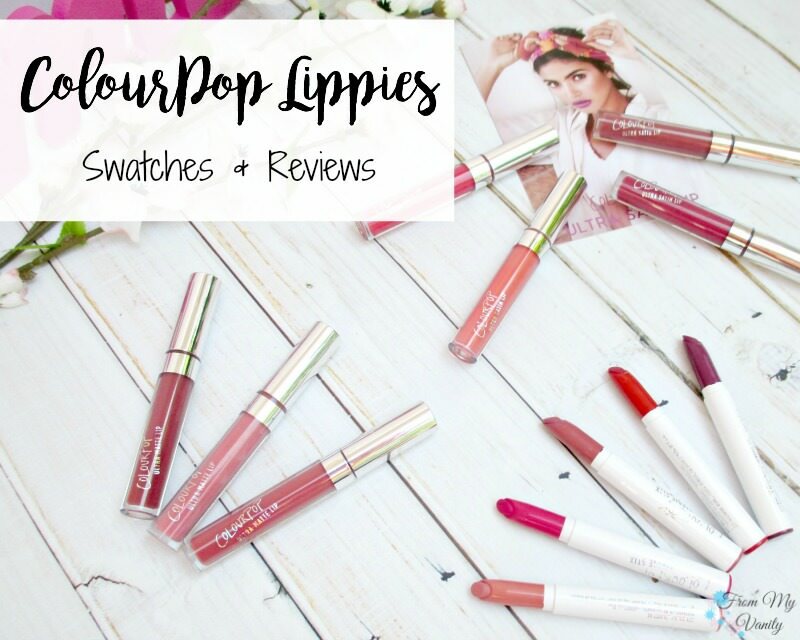 I’ve reviewed ColourPop on my site previously HERE, but that focused more on their Supershock eyeshadows. Which are fantastic to use as a topper right on the center of your eyelid. Such bold pops of shimmer — I love it! 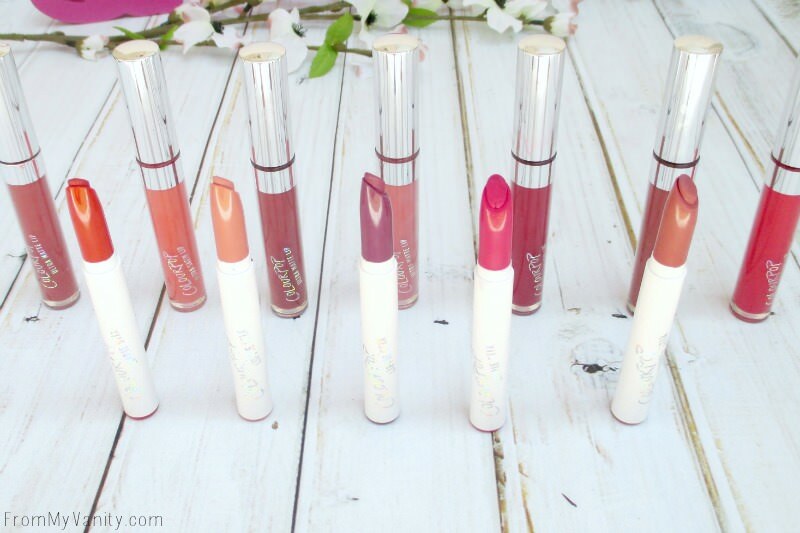 For this review today, though, we’re talking all about the lip products! 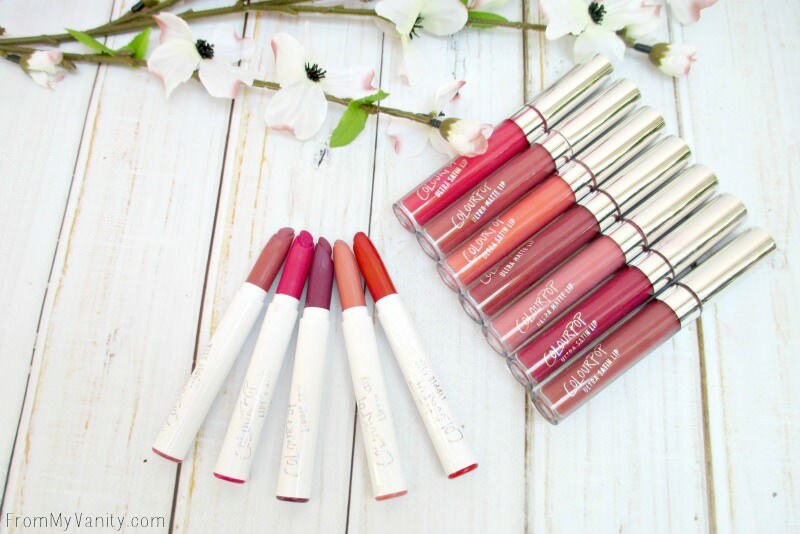 The ColourPop Ultra Satin Lip and Ultra Matte Lip retail for $6 and the Lippie Stixs are $5. And as an added bonus, first time buyers get a $5 off coupon and if you hit $30, shipping is free. Several ways to make these affordable products even more affordable! 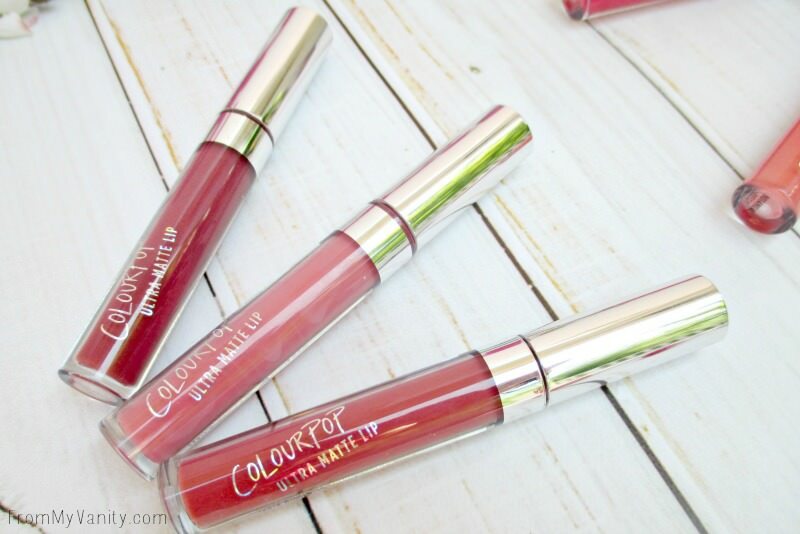 The Ultra Satin Lip and Ultra Matte Lips are packaged in the same kind of tube, which makes it a little difficult to tell them apart without reading the label. Which, honestly, I didn’t see too big an issue with. That is until I took them on a trip and them being in a makeup bag for a week…the labels began to wear off. So…not even a month owning them and almost all the writing has disappeared, making it difficult to tell which is the Satin and which is the Matte. 🙁 I tried to include the label in all the lip swatch pictures so that you can see how they’ve worn away. Personally, this is a con for me. It’s not a huge deal, in the grand scheme of things (like formula, lasting power, etc), but it is disappointing and something I wanted to point out. 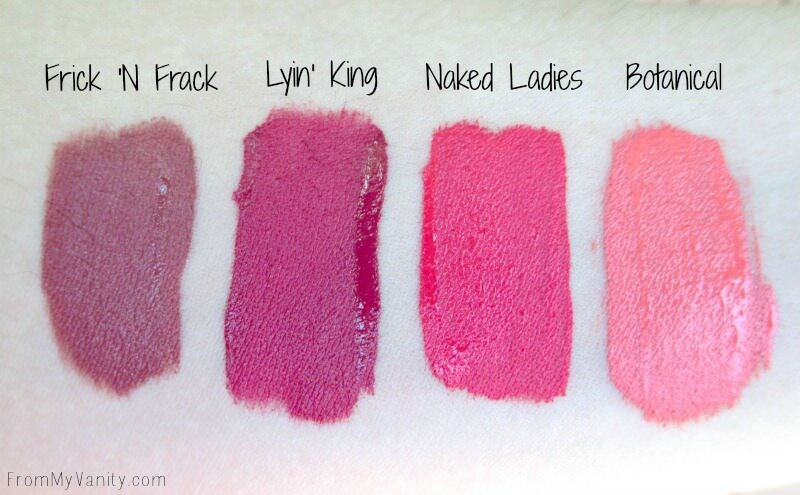 Let’s move on to the swatches and reviews on the individual colors, starting first with the Lippie Stixs. Hype Girl — The original matte formula, this one has a slight sheen to it and also gives a more moisturizer, lipstick-feel to it. Not patchy in the slightest, it stays on well until you eat or drink, then it starts to wear off. Easy to reapply, though. Botanical, Frick N Frack, Naked Ladies, & Lyin’ King — These remind me of the L’Oreal Pro Matte Glosses, but they’re thinner consistency. They go on very opaque, though, with just one swipe — except for Botanical. I would recommend a lip liner underneath to keep it from looking streaky. Another con that I don’t like about all these lip products are that the color it shows on the outside package does not match the actual color you get on your lips. Something to keep in mind, when ordering. They wear really well, though, lasting on the lips for hours. Even with eating, it will wear away slightly, but still stick around. And you can reapply without any issues and it’ll look just as good. 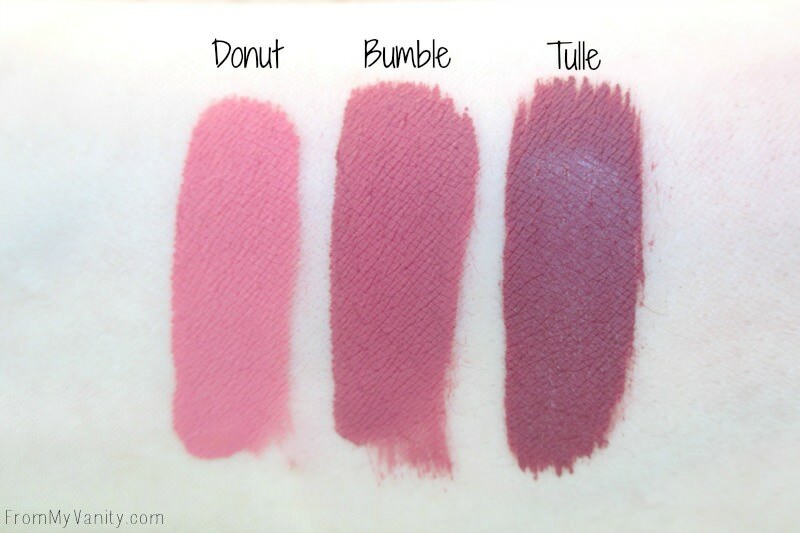 Donut, Bumble, Tulle — These are also very thin in consistency, but just as opaque as the Satins. They don’t take long to set on your lips, and once that happens they don’t budge. They do begin to wear away once you start eating, but mostly just in the inner part of my lips, where the most moisture hits. They layer pretty well, as long as you only focus the additional product on the spot that is fading. If you put to much on top of product already on, it can tend to start feeling thick and ‘goopy’. What are my overall thoughts? I think they’re really affordable, that’s for sure. And the quality is pretty great. 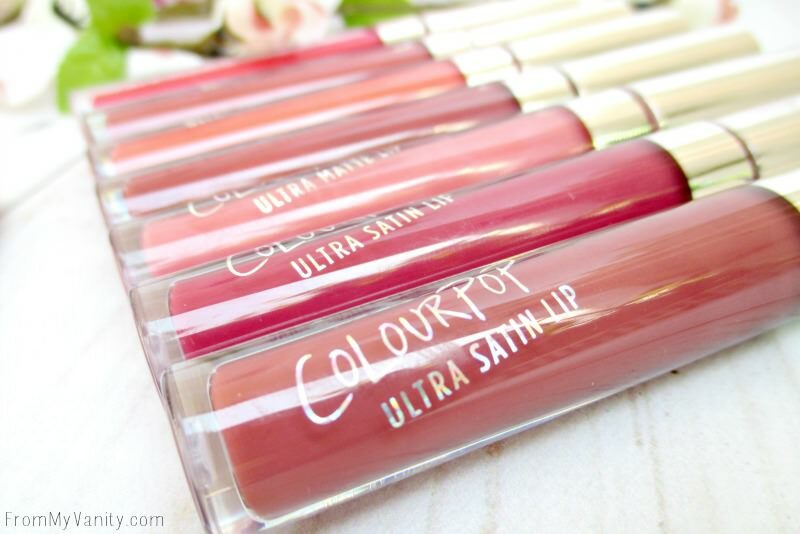 I don’t like the similar packaging and another con I noticed is that the formula inside the Ultra Satin Lip and Ultra Matte Lip separate once they sit for a couple days. When I shake it up, it’ll mix back together, but I have a feeling it will start to turn bad sooner than my other liquid lipsticks. Do I recommend these? I do. I really recommend the Matte X Lippie Stix. 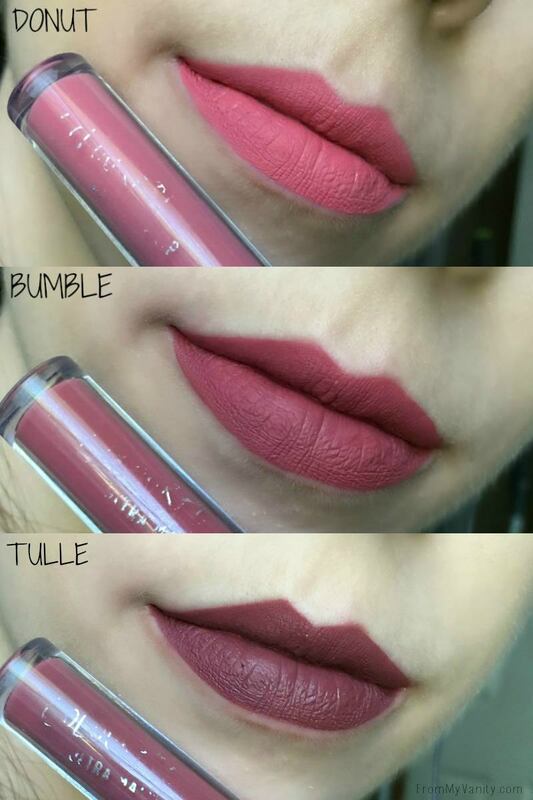 It’s a fantastic formula and I still can not get over how transfer-proof they are for a lipstick bullet. That’s $5 very well spent in my book, and the next time I order from ColourPop I will definitely be getting more. 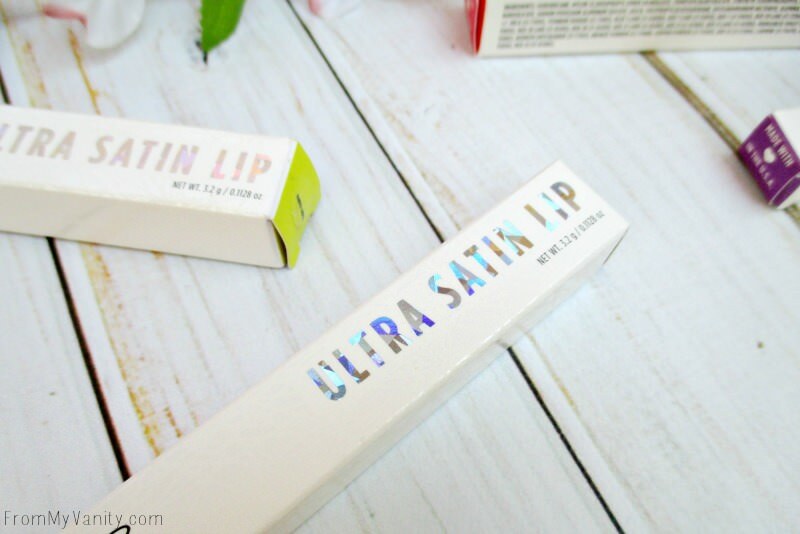 The Ultra Satin Lips I like, and might get one or two more shades. The Ultra Matte Lips…I will enjoy the three I purchased, but I probably won’t get any more. If I want to buy more matte longwear lipsticks from ColourPop, I’d opt to just buy the Matte X Lippie Stixs. 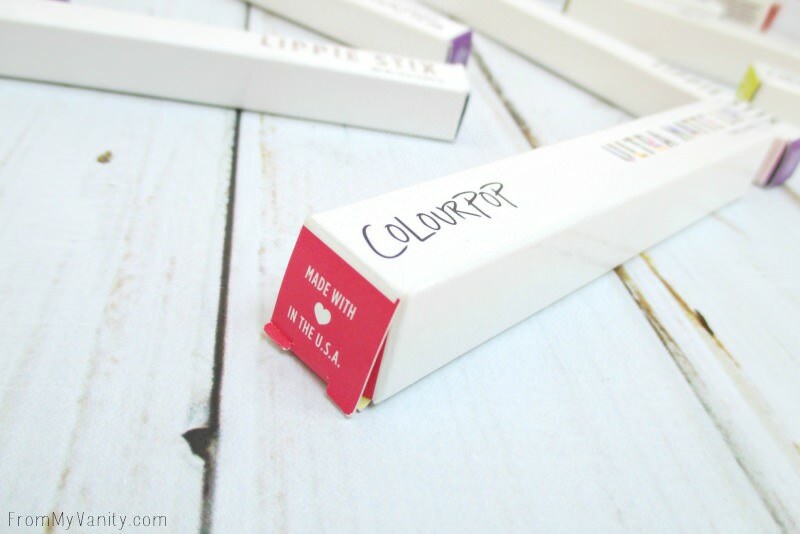 Have you tried the ColourPop Matte X Lippie Stixs yet? Do you have a favorite shade? Share with me below! And if you found this review helpful, please share the pin below! Yes, I am sneaking this in at the end. Thank you to all my FABULOUS readers who read my posts and share with me in the comments! 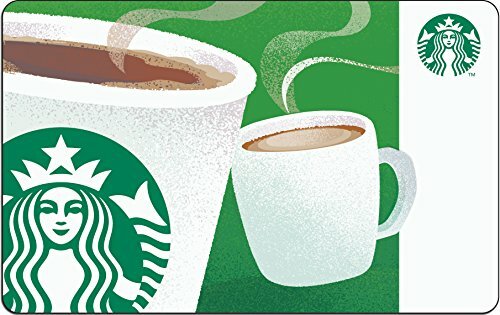 Giving you an opportunity to win $100 Starbucks gift card is the least I can do. Thank you so much! Strange, one would think they would want their branding/wording to stay on the packaging and not easily rub off? And I see what you mean about the color of the product not matching the packaging. 🙁 On a good note – i’m jealous of your lip swatches and cupids bow. Every color looks amazing on you! I am yet to take the leap and make a ColourPop purchase. I love how affordable they are, but I’m just not super into the matte lipstick thing. These all look fab on you, though! PS: my favorite Starbucks drink is a soy caramel frapp! these look fantastic! i really want to try this brand! my fave starbucks drink is a gingerbread latte!! 🙂 thanks for the giveaway! 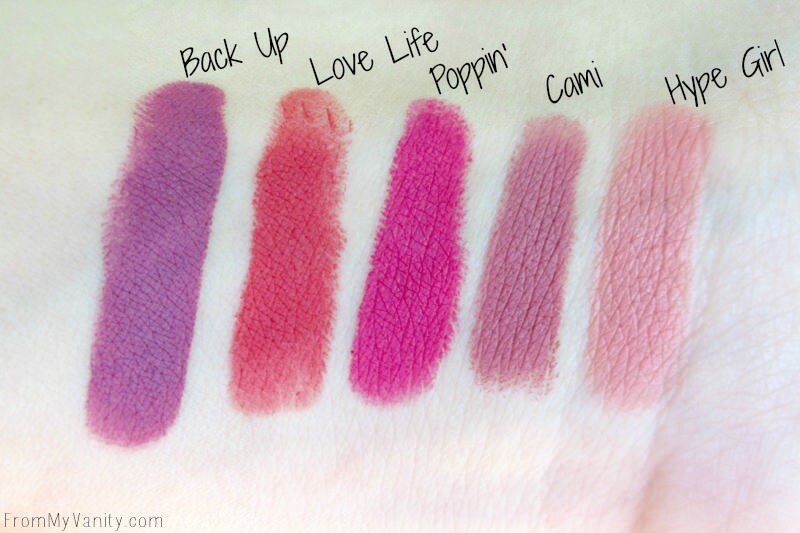 Beautiful shades, especially Cami, which is such a wearable mauve! Loved reading this honest review – thanks for including the cons! I usually steer clear of matte lippies due to the dryness factor, but I love these colors. As for my fave Starbucks drink? Chai Tea latte all the way! I love a bunch of these. I am partial to pink toned nudes and I LOVE matte lipstick. CP has the best lip products! Great picks! Frick & Frack is such a 90s color! Is that cool again? For someone who doesn’t really spend much time paying attention to the colors of my make up, this was a real eye opener. I’m glad I took the time to hop over from the #Alittlebitofeverything link up from last wednesday to read through this. I think I might actually have to take the time to buy a few shades the next time I restock my make up stash. Thanks for checking out my review, I will definitely check out yours. I had to remove the link from your comment, but I did place it linked to your name so if anyone wants to check it out — they can find it by clicking on your name. 🙂 Thanks for stopping by!